Today Yvette Stanton of Australia is launching her latest book: Sardinian Knotted Embroidery. If you're already familiar with Yvette's other books, you will know that this latest book can safely be purchased sight-unseen. Yvette makes excellent needlework books. After writing half a dozen, she knew what to do and she did it very well. She is also a very talented designer and needlewoman. You will delight in her work and the projects she has proposed. 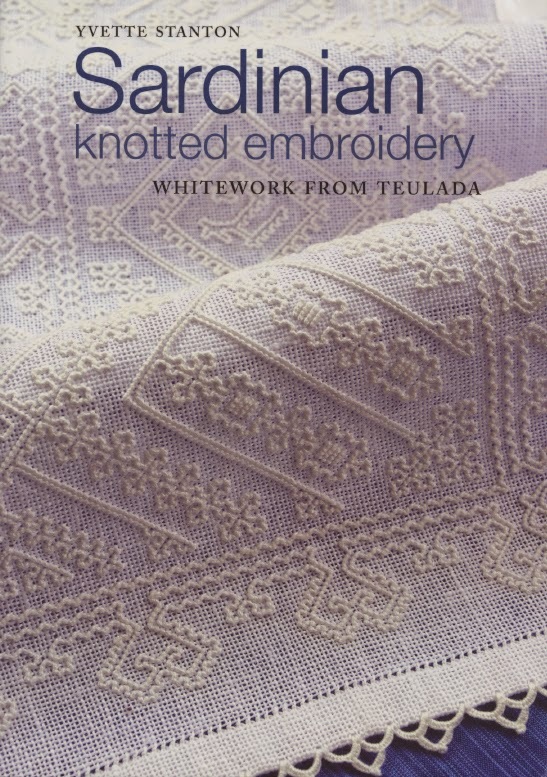 Sardinian Knotted Embroidery - Whitework from Teulada is Yvette's seventh needlework book and this time she has turned her eye on Italy. She and her family vacationed in Italy so she could better research this book and she was able to meet people who embroider this technique, see their manufactures and absorb the tradition and history of it in it's native environment. All of this shows through on every page as does Yvette's talent and enthusiasm. She takes your hand and stays with you every step of the way through learning Sardinian Knotted Embroidery - whether you are right or left-handed. Yes, you read that correctly. There are left-handed instructions for the embroidery as well as right-handed ones. And I'm not talking about just mirrored images, but real, helpful, achievable left-handed instructions as you see, Yvette herself is a left-handed stitcher. The book starts off with a quick introduction and some background history, there is a bit about materials and equipment then by page 15 you dive right into the beautiful projects that Yvette has designed and stitched herself. There are 11 projects in all of varying degrees of difficulty and time-investment: the smallest item being a necklace pendant and the largest being a tablecloth. Even though the tablecloth is the biggest, it is simple enough that you can see yourself actually stitching it and not having it become a UFO (unfinished object). Yvette's photography shows off the projects nicely and it's easy to just sit and drool for a long while before picking up your needle and thread! After the projects section are the instructions which fill the remainder of the book. There are not just instructions on the embroidery, but also on hemming which include planning, folding, mitred corners and three different hemstitches with complete right and left-handed instructions as well as a lacy edge treatment. Instructions on the actual stitch are enhanced by tips, tricks and advice such as right and left-handed instructions on working the knot, changing directions, ending a motif, ending a thread, changing the thread, particularly tricky motifs and how to handle them, typical mistakes and how to avoid them but also how to fix them! All of these things have both right and left-handed diagrams to help you out. Then there are instructions on damp stretching the work once you are done the projects and finally where to get supplies. A removable envelope of fold-out patterns is glued to the last page. Text in English. You can purchase Sardinian Knotted Embroidery direct from Yvette's website where you can also get thread and fabric too including imported Italian linen. If you're contacting her right now, give her a few days to answer you, she is at a needlework event in Adelaide launching the book and teaching classes. Today, my article on the Italian Cassone or Hope Chest is making a guest appearance on the La Bella Donna website, with my permission of course. "Italy during the trecento, quattrocento, and cinquecento. I especially am enamored with the city-states of Firenze and Venezia. 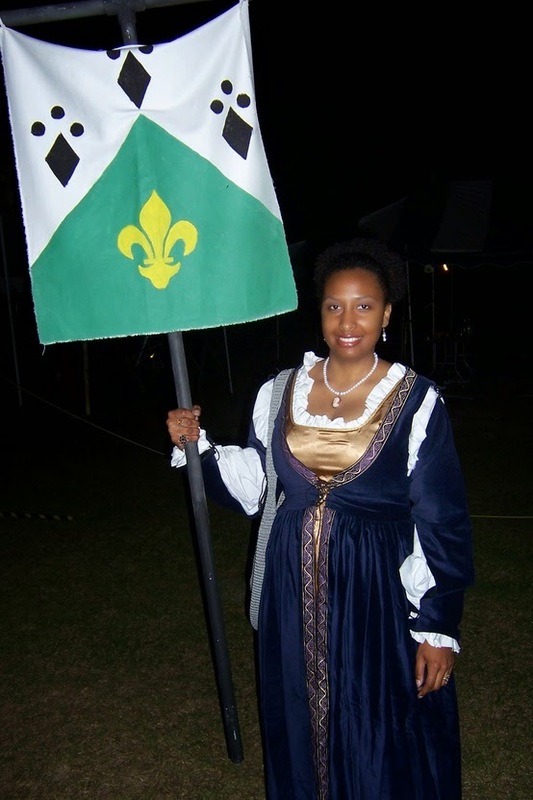 So for my "persona" within the SCA I have chosen to learn about and portray a woman born in 'Florence' in the late 1400s who lives in 'Venice'. I have, through research, chosen a name and during our events I dress, speak, think, and even dine as she would have (except during the lovely steamy summers, where I transport further back in time and wear Roman or Greek garb)." Signora Giata has done a great deal of research on Italian women and much more and has made her research available for free download here. There is a lot more to download and read here on what she's been doing. Grab a cup of tea and settle in for some interesting reading!